Terminal stations, like Grand Central, are at the end of train lines. At these stations, trains come in from one direction, unload, are cleaned, and board new passenger before reversing towards the direction from which they came. 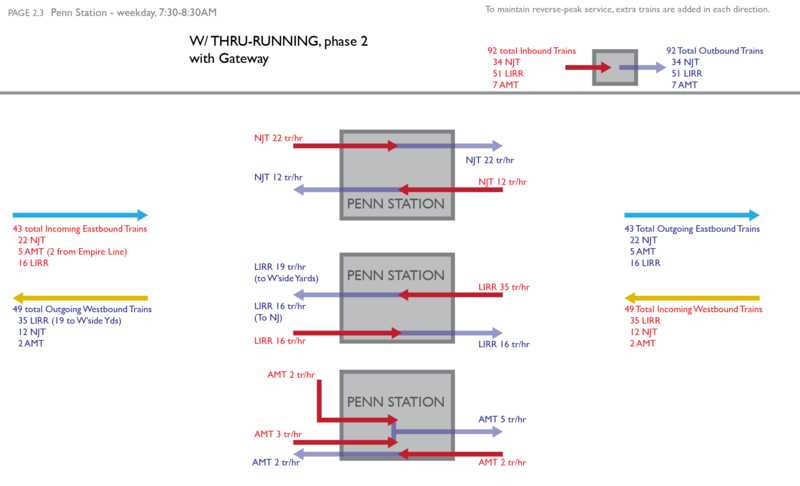 Through‐running stations are all the stations between two terminals. At these stations, trains come in from one direction, unload and load passengers, and continue on in the same direction. Terminal sta­tions force all trains to share the lim­ited track access in and out of the sta­tion. 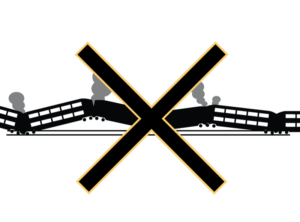 Because a train enters and leaves on the same set of tracks, trains cross paths as they back in or out, cut­ting off all traf­fic to the sta­tion as a sin­gle train enters or leaves. 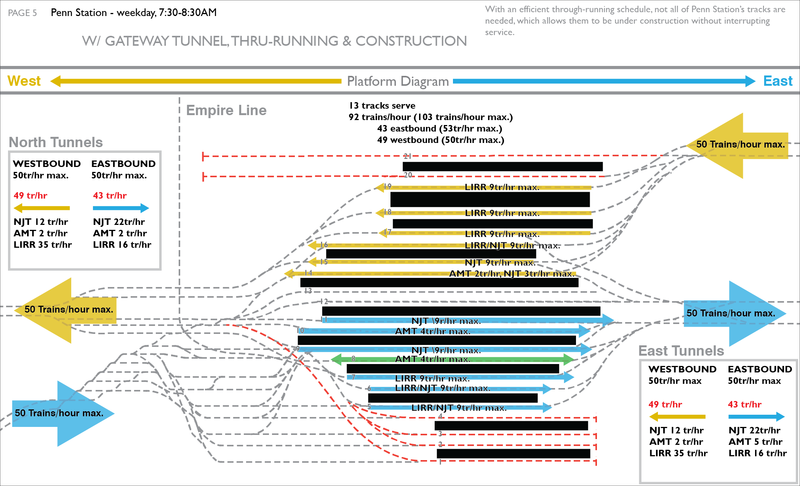 Through‐run­ning, on the oth­er hand, elim­i­nates this inef­fi­ciency by run­ning trains through the sta­tion. Terminal ser­vices are bet­ter suit­ed for sta­tions that do not have high rid­er­ship and many trans­fer­ring pas­sen­gers. WHAT ARE THE BENEFITS OF THROUGH‐RUNNING? Before construction of the Philadelphia Center City Commuter Connection (CCCC) in 1983, the Reading and Pennsylvania Railroads had separate terminals in Philadelphia, and served different parts of the core. The CCCC united the system, allowing trains from every branch to access every part of the CBD. This new service led to an immediate 20% increase in ridership. Every skyscraper constructed in Philadelphia since the CCCC opened – including the city’s 10 tallest buildings – is within a five‐to ten‐minute walk of one of the three CBD stations that were part of the project. The skyline of Philly was transformed by the construction of the CCCC. Before the construction of the RER, journeys between opposite sides of the Paris Metropolitan Region (known as the Ile‐de‐France) were not practical. The RER created new north‐south and east‐west lines through the core of Paris that connected to all parts of the Ile‐de France at the new Chatelet‐ Les Halles station. By linking previously disconnected radial lines into the center of Paris, the new links dramatically cut travel time for hundreds of millions of trips every year. The RER is designed to serve simultaneously as both a relief line for overcrowded metro lines within the Paris core as well as a regional rail service. RUN follows this same principle. Until the late 70’s Paris’ commuter rail lines terminated at eight different stations (left). With the RER sys­tem, com­muter lines use through‐run­ning, with rail yards and ter­mi­nals at the out­skirts. 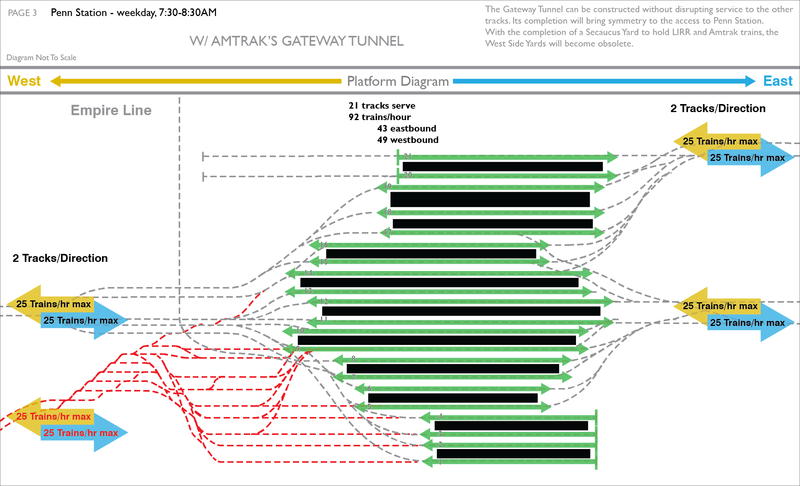 Trains pass through the busi­ness dis­trict areas, where trans­fers are avail­able between three com­muter lines and six sub­way lines (right). The RER allowed Paris to construct the largest purpose‐built Central Business District in Europe – La Defense – around this new connection. Crossrail, which is expected to open in late 2018, unites a set of four radial branch lines into a new east‐west line through the center of Greater London. The new route will dramatically speed and simplify travel across London and connect to both the London Underground and Overground networks. The opportunity to access far more of the region has sparked intensive development around some of the planned stations, including in Canary Wharf and the London Docklands. Even with a maximum capacity of more than 70,000 passengers per hour, Crossrail is expected to be at capacity from the moment it opens. Crossrail will connect currently separated parts of Greater London and improve transit through the City’s core. Image Credit: Crossrail Ltd. The Jubilee Line extension led to the success of Canary Wharf as a major business distrit, and the Crossrail station led to further planned expansion. ReThink Studio has stud­ied the fea­si­bil­i­ty of phas­ing this project, and con­cluded that with the com­bined oppor­tu­ni­ties of the new Gateway tun­nel and Moynihan Station, through‐run­ning is not just prac­ti­cal but crit­i­cal to improv­ing com­muter ser­vice through­out the region. The increased effi­cien­cy that through‐running brings will raise Penn Station’s capac­i­ty. 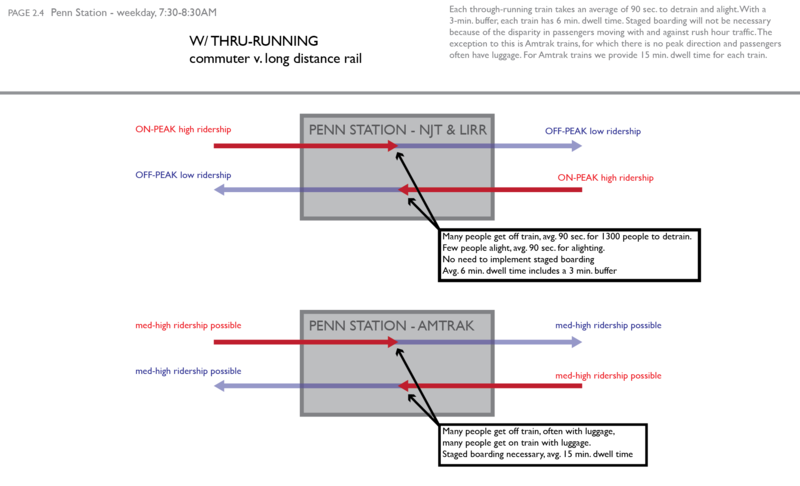 It would allow for track‐lev­el recon­fig­u­ra­tions that would widen Penn’s plat­forms by extend­ing each plat­form over one of the two tracks that abut it. This alter­ation pro­vides two ben­e­fits: the pro­ce­dure does not require re‐lay­ing tracks, which will expe­dite the con­struc­tion process, and with a sin­gle track between each pair of plat­forms, pas­sen­gers will be able to load and unload on both sides of the train, fur­ther increas­ing effi­cien­cy (sim­i­lar to the 33rd St. PATH sta­tion). 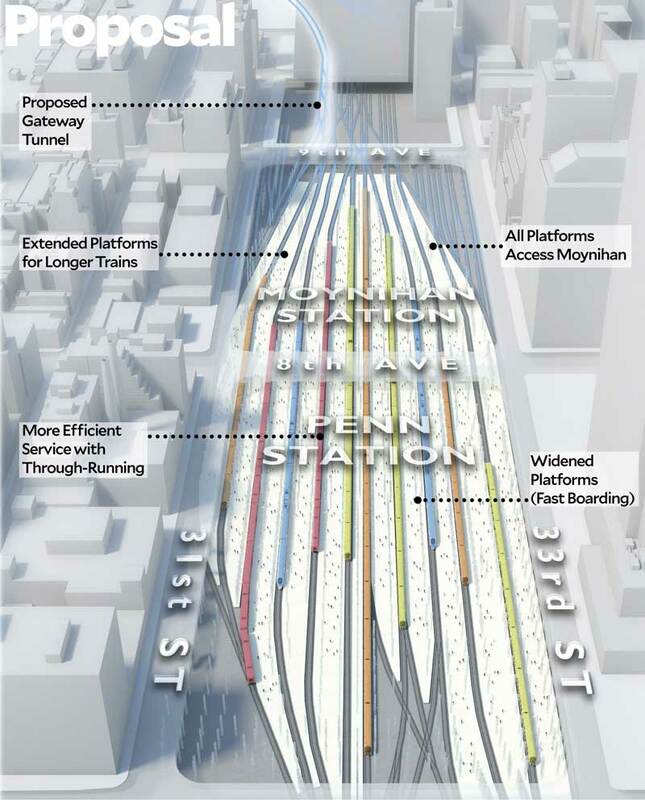 Furthermore, the expan­sion of Penn Station’s func­tions into Moynihan Station across 8th Ave, pro­vides a rare oppor­tu­ni­ty to increase much‐need­ed ver­ti­cal cir­cu­la­tion to the tracks. Penn’s new plat­forms will also be wide enough to bring four bi‐direc­tional esca­la­tors to the plat­form at each access point, alle­vi­at­ing the bot­tle­neck to get on and off tracks that cur­rent­ly plagues the sta­tion. Paired through‐run­ning requires phased imple­men­ta­tion of a non‐paired sys­tem. It elim­i­nates the use of ter­mi­nat­ing tracks in the cen­tral busi­ness dis­trict, but the last stop on all tran­sit lines remains the same. This requires a phys­i­cal tran­si­tion of agen­cies and train con­duc­tors at those final des­ti­na­tion sta­tions because dis­parate agen­cies are “paired” through the use of the same rolling stock. Non‐paired through‐run­ning allows agen­cies to keep their cur­rent rolling stock by con­tin­u­ing trains through the city cen­ter to new ter­mini in the city’s out­skirts. 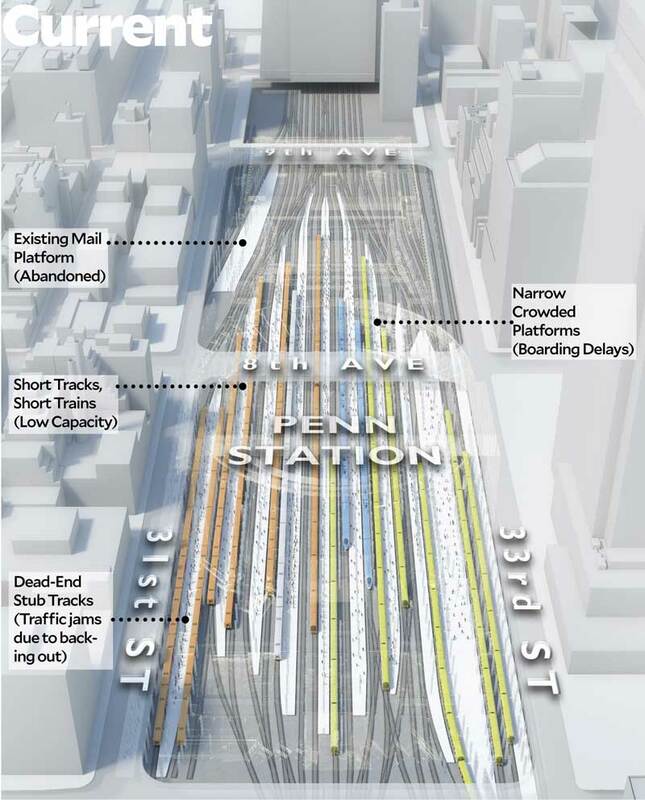 In New York, trains ter­mi­nat­ing at Penn Station would instead ter­mi­nate at sta­tions out­side of Manhattan. In ReThinkNYC’s pro­pos­al, the­se new ter­mi­nal sta­tions would be Secaucus Junction and Port Morris, with a through‐sta­tion at Sunnyside. For exam­ple, LIRR’s Montauk Line would con­tinue through Penn Station and ter­mi­nate in Secaucus, New Jersey, just west of Manhattan. NJ Transit’s Bayhead Line would con­tin­ue through Penn Station and ter­mi­nate in Port Morris, Bronx. Neither agen­cy would be pressed to over­haul its oper­a­tions or rolling stock, and Penn would see more effi­cient ser­vice. In a non‐paired sys­tem, it would be pos­si­ble to make long term plans for imple­ment­ing paired through‐run­ning and any future over­hauls that the city’s sys­tem requires. A train arriv­ing from the east ter­mi­nates on one plat­form, and a train arriv­ing from the west ter­mi­nates on anoth­er plat­form. Each train changes direc­tion, return­ing to where it orig­i­nat­ed from. 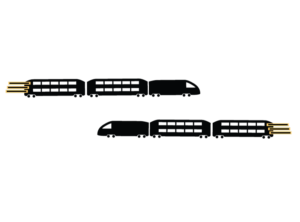 Paired Through‐Running: The same train serves all west­bound pas­sen­gers, and a sec­ond train serves all east­bound pas­sen­gers. 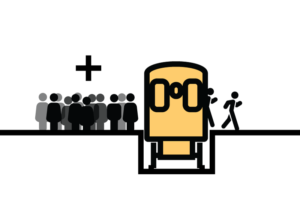 Non‐paired through‐run­ning: Westbound trains arrive, drop off and pick up pas­sen­gers, and move on, still west­bound. Eastbound trains do the same. The trains do not share ser­vice sched­ules, plat­forms, oper­a­tions, but can stag­ger their ser­vice along the same tracks, and use the same rai­l­yards. The differing power systems for rail across the New York City metropolitan region present a serious challenge to building a unified network. Trains run on five different types of power, detailed on the opposite page. What this means in practical terms is that the train cars used by Metro‐North and Long Island Rail Road can’t run in New Jersey, and vice‐versa. 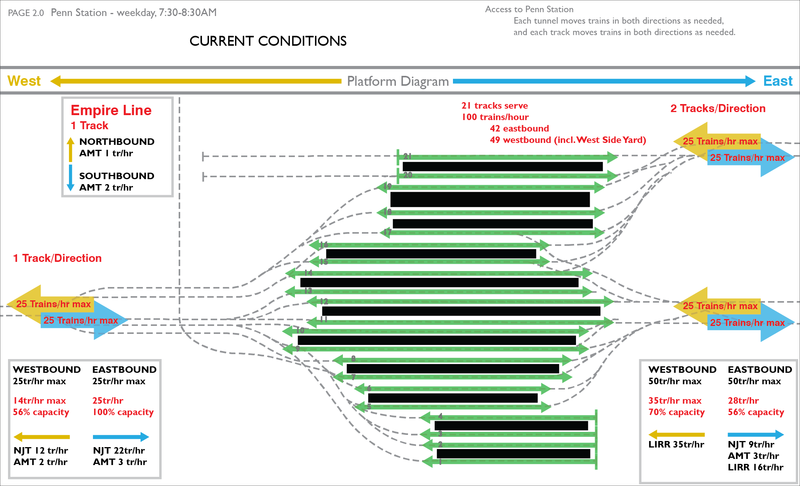 Additionally, while most stations in the region have platforms that allow for level boarding, not all do, making it even more difficult to develop a single regional network. To allow for the region’s three suburban networks to truly operate as an integrated whole, RUN would extend electrification further out on many lines. RUN would also upgrade the oldest catenary system – 12kV 25Hz AC – to the modern standard of 25kV 60 Hz. 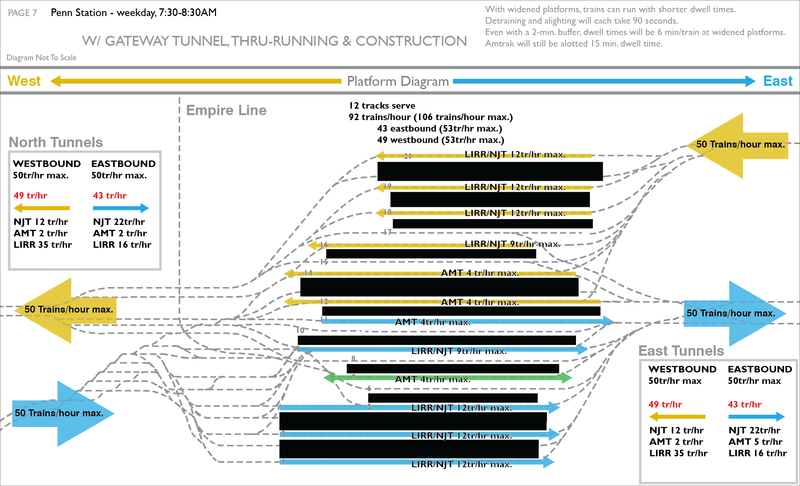 Additionally, we would work to transform low‐level platforms to permit level boarding, with priority for the main RUN lines. 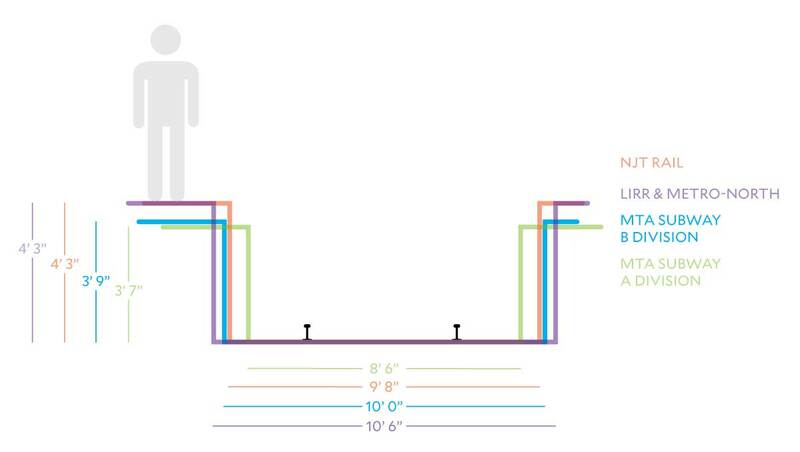 Today, the rail systems in our region have varying platform widths and heights. 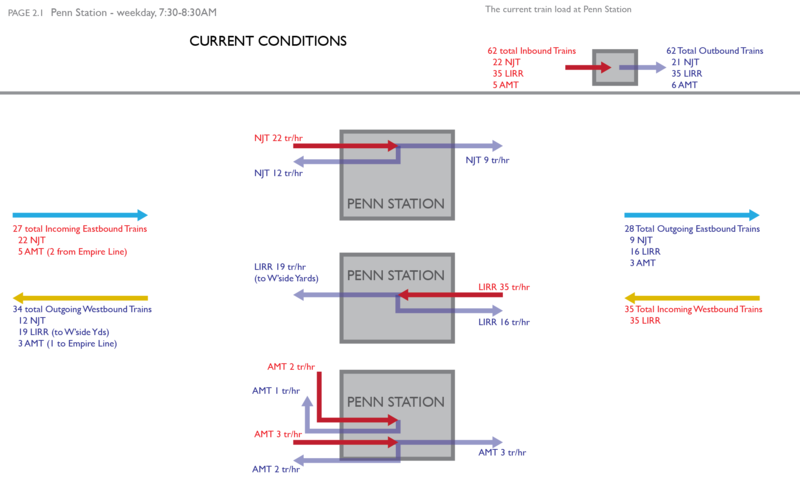 Today, power standards between commuter rail lines vary in voltage, current, and contact system (Left). RUN proposes standarizing power standards and eliminating usage of the oldest catenary system (12kV 25 Hz), and extending electrification of LIRR and NJT rail lines (Right).